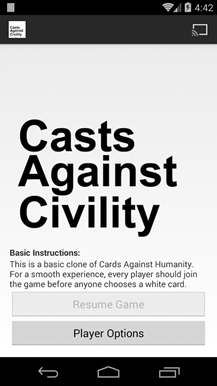 Cards Against Humanity is a card game (you know, the kind without monsters or life points) that's been gaining popularity ever since its successful Kickstarter campaign. 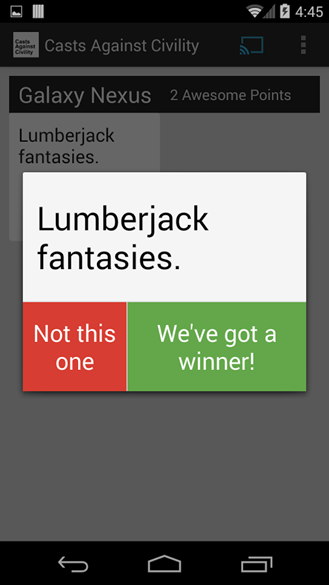 It's a decidedly inappropriate take on Mad Libs, and part of its charm is that you can get it in a published form or download it and print it out yourself. 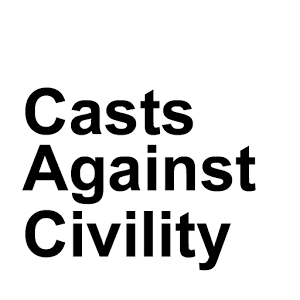 Thanks to the Creative Commons licensing terms of Cards Against Humanity, the core concept has been adapted into a Chromecast game, creatively titled Casts Against Civility. Once all the players are connected to a Chromecast, one is chosen as the Card Czar. 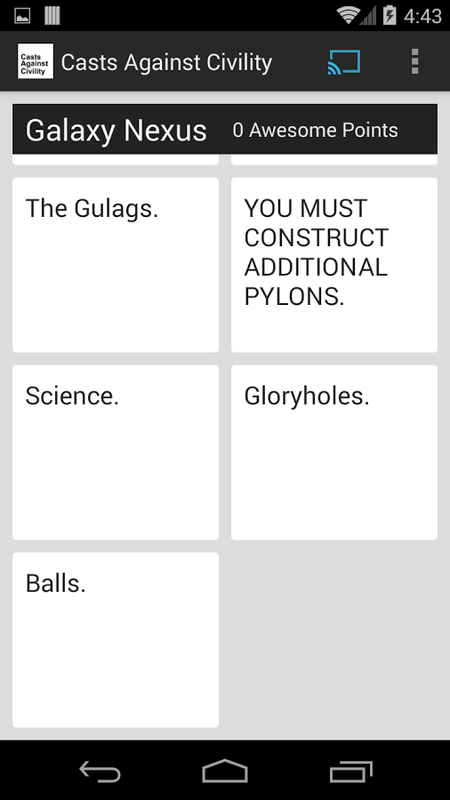 The Czar is given a black question card, which the other players can answer with random answer cards. 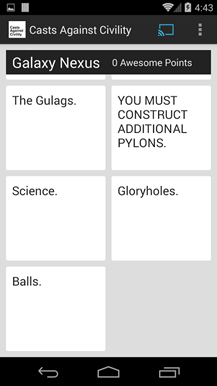 The point of the game is to answer the question with the most humorous and/or vulgar possibility, as determined by the Czar. 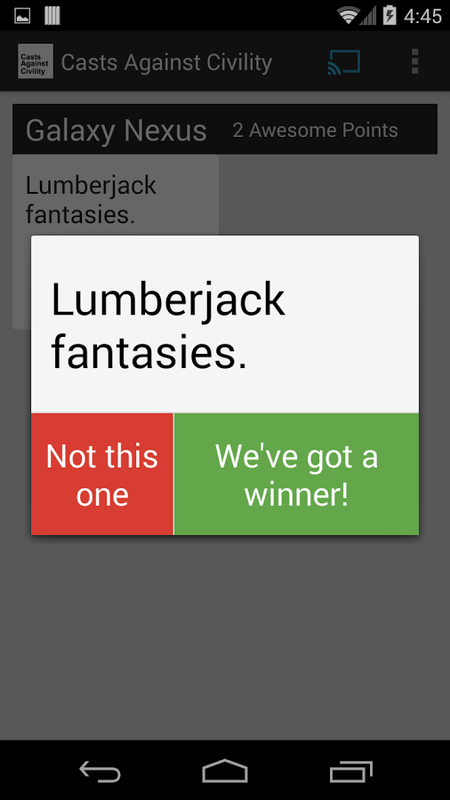 The winner of each round gets a point. Wash, rinse, repeat, hilarity ensues. There isn't much of a point to using a Chromecast to play this game - logically, getting a bunch of people with Android phones or tablets and a TV and a Chromecast together it at least as hard as downloading the printout version of Cards Against Humanity. That said, if you do have all the necessary components, it's an interesting use of the Chromecast in a way that Google probably never intended. 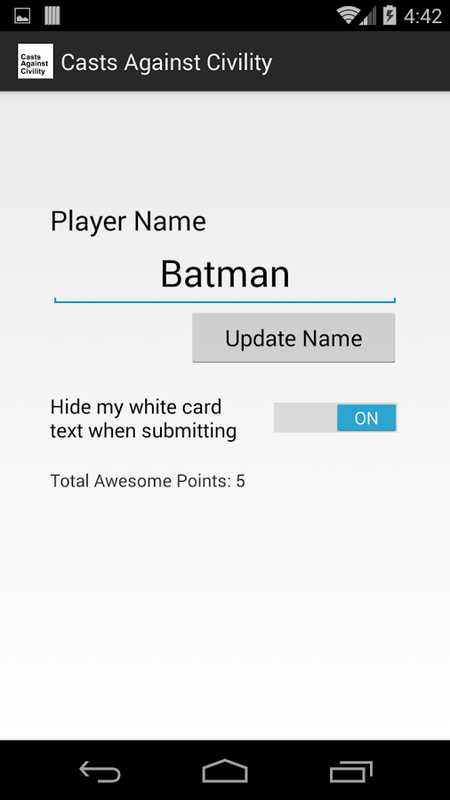 For more multiplayer Chromecast games, check out Qcast.